My trip to Seattle was great fun - about as cold as this Arizona native can stand - but fun nonetheless. 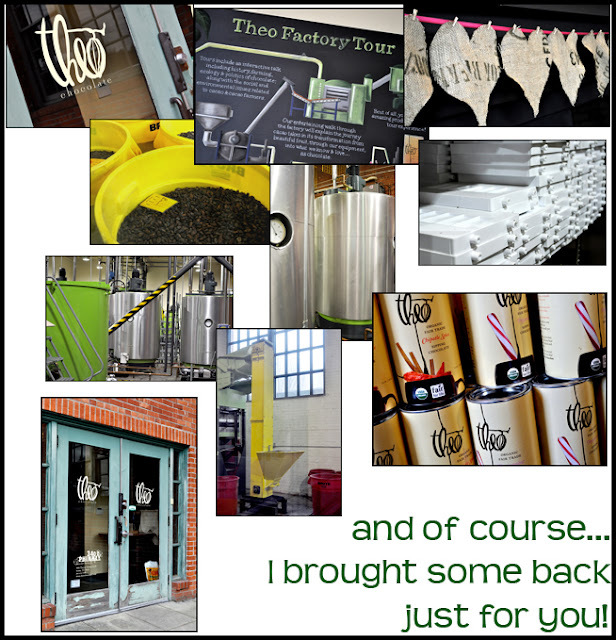 We three gals took a factory tour of the Seattle chocolate company, Theo. Can you imagine a better way to spend an afternoon? We put on fun blue hair nets, learned a BUNCH about chocolate and the Theo company. There was also some sampling. Oh yes there was! The Chipotle Sipping Chocolate was divine. Theo is one of only 20 bean to bar companies in the country. They are fair trade and all organic - something to feel good about while you indulge. 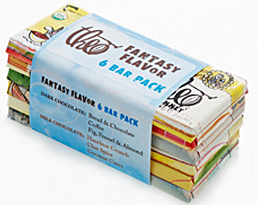 Just leave a comment on this post for a chance to win this 6 pack of fantasy flavor chocolate bars. so glad you got to be with your girl for her birthday...sound like you had fun! Sorry it was a bit cold for you here!.....but the warmth of your time with your beautiful one was the best I am sure! I am laughing to myself at the thought of you three in that factory! What a feast for all of the senses! Now I am laughing out loud at the thought of my boys and myself there! What a glorious occasion that would be! And it looks like such a magical place! Perfect for a birthday weekend! I love tours, they are usually so much fun and everyone is in a good mood. While your have been away it has rained (thank goodness) but I am sure not as much as where you were ! I'm trying to think of a better place for a tour than a chocolate factory, can't think of one! That tour was awesome. I can't believe Daddy ate the chocolate already! I so want to go to Seattle sometime, this may just have to be added to my list of places to visit! Oh I want to win, and then chocolate cherries again for all! Sounds like a great company; I'm going to google them now....thanks for sharing! This little Oompa Loompa is smiling broadly [not just at the thought of the blue hairnets] and although I'm too far away for these little treats to travel, I thank you for the gift of imagining their flavours. we visited seattle twice this year, we love it so much. how in the world did we miss this chocolate factory, though?! must go back again now! looks like it was a great and very fun visit! Yum! Chocolate comes in six packs? Fantastic! Hope you enjoyed the beach. definitely worth tasting!! i loved it. your pictures captured the tour perfectly. too bad the wonderful aroma of chocolate in the air can't go along with them!! thanks for sharing and good luck to the bloggers! Wonderful that you could share time together in Washington! A special event for you all! Always so thoughtful for you to share the delights of the tour with your blog friends. got to tour their factory. THose chocolate bars look so yummy. O M G ! I'll do almost ANYTHING for chocolate - and especially to try new kinds. Thank you for the opportunity! Yummy! touring chocolate factories are so much fun! so glad that you enjoyed your time with your friends Jeanette! those chocolate bars you brought back look delicious! Hope you're having a a wonderful week!